Aug. 15, 2007 (Wednesday) 6:30pm Washington Hospital Arthritis Support Group - Anderson Auditorium. Oct. 7, 2007 (Sunday) 10am-2pm St. Rose 6th annual Health Fair. www.kimochi-inc.org and register with them. 963-7070 or go online to www.whhs.com to register. May 28, 2008 (Wednesday) 1pm-2pm Osteoporosis and COPD (Chronic Obstructive Pulmonary Disease) at Washington Hospital, Fremont. Please visit www. whhs.com or call 510-494-7025 Better Breathing for Life Club for details. September 18, 2008 (Thursday) Time: 6pm-7pm Arthritis Foundation Talk on Ankylosing Spondylitis at Castro Valley Adult School. February 5, 2009 (Thursday) 1-2pm Mountain View Senior Center. Topic: Do I have Arthritis? 266 Escuela Avenue, Mountain View, CA 94040 (650)903-6330. May 9, 2009 (Sat) Arthritis Walk at Livermore, CA. Registration: 8:45am. Come join our team! Team name: Shibuya's Strollers, please donate to our team. Thanks. able to meet other patients living better lives with biologic therapies. June 29, 2009 (Monday) Washington Hospital: "Arthritis: Do I Have One of the 100 Types?" Washington Hospital, Anderson Auditorium - 1:00 PM to 2:00 PM. 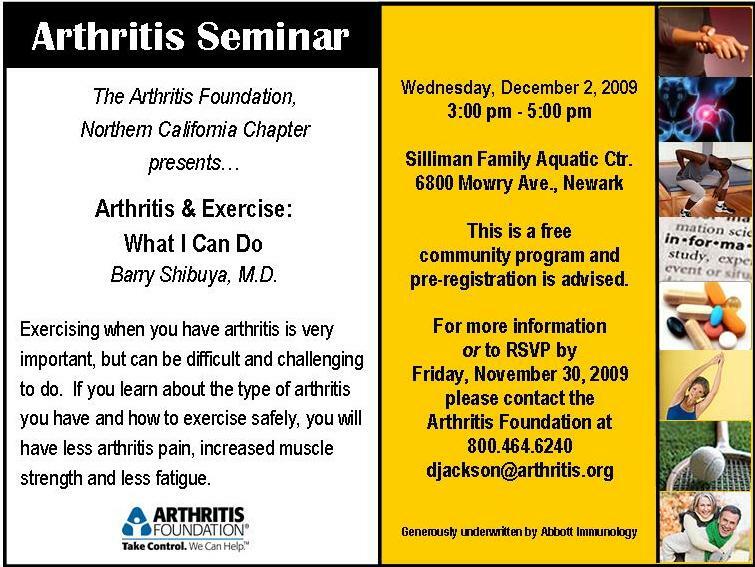 October 17, 2009 (Sat) 9am-3pm Arthritis Foundation Expo at Pleasanton, CA. Hilton Hotel, 7050 Johnson Dr., Pleasanton, CA 94588 (925) 463-8000. Arthritis Foundation's Website for Expo updates. the Northern California Chapter of the Crohn’s & Colitis Foundation of America. - To learn more about the symposium and to register, please go to www.ccfa. Nov 14, 2009 (Saturday) 10am to 4:15pm. Foundation ' s Aquatics Class and medications. Aquatics Class will be starting in January 2010. 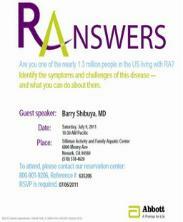 To sign up for the talk, please call 800-464-6420.
at the Timpany Center ( 730 Empey Way , San Jose , CA 95128). 5/ 1/2010 (Saturday)- 2010 Tri-Valley Arthritis Walk - Livermore, CA. 5/15/2010 (Saturday)- 2010 Arthritis Walk - San Francisco, CA. 5/22/2010 (Saturday)- 2010 Arthritis Walk - San Jose, CA. Date: Thursday, May 20, 2010 Times: Noon to 1 p.m. Lunch & Learn - Bring your lunch and join us for our “Lunch & Learn” series ! Call (800) 963-7070 to reserve your space! Club event. For more info please contact WHHS Pulmonary Rehab at 510-494-7025. 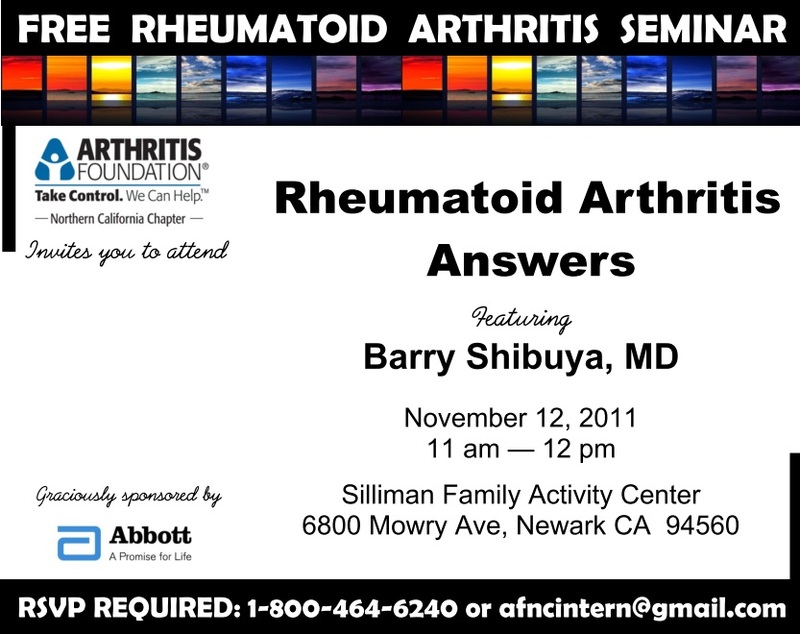 Nov 13, 2010 (Sat) 2:30 - 3:30pm "Arthritis 101: Do I have arthritis? What typer of Arthritis do I have? What can I do to manage my arthritis?" at the Kaiser-Hayward for the Mended Heart Club.